Cumin seeds are a staple in Indian, Middle Eastern and Mexican cuisines. They are sharp and pungent and have a slight sweetness to them when they are chewed. The seeds are used whole in tempering or in the form of an aromatic powder that goes into curries, dips and salads. They are not just aromatic, but are packed with nutrients. The seeds are rich in monosaturated fatty acids, vitamins A, B complex, C, E and K, minerals like sodium, zinc, copper, potassium and manganese. Let us see what the health benefits of cumin seeds are. 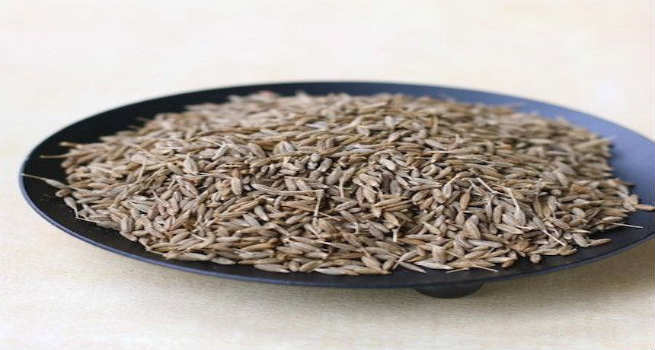 The thymol that is present in cumin seeds help stimulate all the glands that are responsible for secreting enzymes, bile and other acids which help in digestion. Drinking water in which cumin seeds were boiled helps in relieving flatulence from indigestion. Cumin seeds are rich in a compound called cuminaldehyde which is known to increase the secretion of saliva which is the main source of digestion. Sprinkle some cumin seeds or cumin seed powder in your food to help you digest it better. Chew some cumin seeds to get instant relief from acidity. Cumin seeds are composed of aromatic essential oils and caffeine which help in easing the congestion in the respiratory channel and in alleviating asthma and bronchitis. It loosens the phlegm in the respiratory tract and makes it easy to expel it from the wind pipe. Gargle every night with some warm water in which cumin seeds were boiled in order to get relief from an irritated throat. The essential oils in cumin seeds help weed out any viruses in the body. The vitamin C and iron in cumin seeds helps strengthen the immune system and fight the infection from common cold. Replace your regular drinking water with a potion of a liter of water in which 1 tsp of cumin seeds are boiled until the water changes color. Strain this and sip on the water throughout the day to build resistance and to fight the cold. Cumin seeds are rich in iron. Adding cumin seeds in your daily diet will help increase your hemoglobin count and reduce effects of anemia like fatigue, digestive troubles and anxiety. Cumin seeds not just detoxify the body but also help produce anti-carcinogenic enzymes in the body. Being rich in vitamins and minerals, coupled with its ability to help in digestion makes cumin seeds the best ingredient to prevent colon cancer. Being rich in iron, cumin is very good for mothers who are lactating. The thymol in cumin seeds eases and stimulates the secretion of milk from the mammary glands. Cumin seeds are also rich in calcium which is essential to produce milk in lactating mothers. Cumin seeds are rich in vitamin E which is essential for the upkeep and repair of the skin. Washing the skin with cumin seed water helps relieve any inflammation and the anti-microbial essential oils in it help treat infections. Cumin seeds also tend to detoxify the body and cool it from within. Drinking cumin seed water helps control the eruption of heat boils in the body. With so many health benefits associated with cumin seeds, it will be a crime to not use it in food. So go ahead and throw in some cumin to your food to add a zing to the taste and to make it healthy.